Today is Friday – and that means that Susanna Leonard Hill has set up a linky for picture book reviews. To see more great book reviews and activities, please click here. I also want to announce the winner of a copy of My Warp Speed Mind by Donalisa Helsley. Congratulations, Jaymie…please contact me and I will get your book in the mail right away. This afternoon, I saw a video of awesome food art, I knew I had to find a book that would address the problem of fussy eaters. Scroll down to the bottom of this post for the video – you will be amazed. Do you have any fussy eaters in your house? I can sympathize because I was one…and so was my oldest son. If picky eating was one of the sports in the Winter Olympics, would your child win the gold medal? Here’s a great picture book that might help your child try new foods. After watching the video, I challenge you to make a simple plate of fruit and veggies, cheese and crackers or even a peanut butter and jelly sandwich into something clever and cute. My kids loved when I made carrots and raisins and apple slices look like animals…it was lots of fun! The great master chefs say that presentation is more than half the enjoyment of a good meal – why not give it a try. Make pancakes and give your child blueberries or raisins to make a happy face. 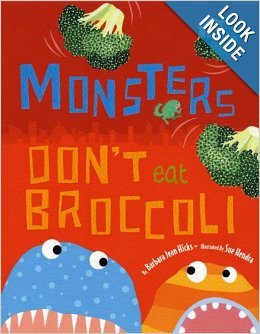 This entry was posted in Food Art, Fussy eaters, Healthy Eating for Kids, Perfect Picture Book Friday and tagged Giveaway, Monsters Don't Eat Broccoli, My Warp Speed Mind by Donalisa Helsley, Picky eaters, picture book review by viviankirkfield. Bookmark the permalink. And, neither did George W. Bush. Really great book selection with some wonderful food ideas to make food more attractive. 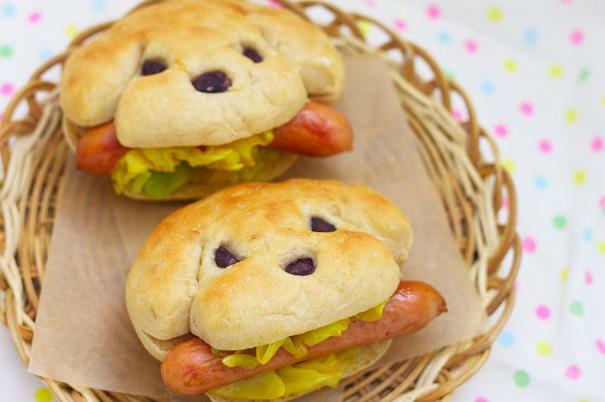 I hated hot dogs as a kid. I like what some mothers do with vegetables– puree broccoli and other vegetables in a blender, freeze it in cupcake tins and pull out what they need and add it to sauces, soups, etc. and the kids don’e have a clue their getting their vegetables. I know — sneaky. I love having a variety of colors on my plate ~ mostly from veggies and fruit. Yum! I also wonder how these people have so much time…most of those dishes would be very time-consuming to make…perhaps they see it as a venture into creativity, kind of like a painter or musician. My son received a photo book of funny food for Christmas. I cannot recall the title at the moment. We are a bit fussy at our house. What? I can’t believe my food art didn’t make it into this video! I’ll have to check if our library has this book. Fortunately my kids eat broccoli (one of them loves it) but some other foods can be a bit hard, so this could be a fun read. By the way, did you get my query letter? No rush if you did. I just want to make sure it didn’t get lost in cyberspace. Milka…you are amazing! I love these posts…I’ll try to link them to mine tonight. No problem about the query. Really, there’s no rush and I appreciate any advice you have. I don’t necessarily have a picky eater….I have a moody eater. I can’t think of anything he really doesn’t like….but once in awhile he gets in a ‘mood’ and spits out something he usually likes and says, “YICK!”…..grrrrrrrr…. it drives me wild. The Edible Art is great, Vivian. Still smiling!!! This book sounds very cute! I love the food art pictures you showed! 🙂 I am actually working on a PB draft for 12×12 about this topic (kids and vegetables) 🙂 I am going to get this book! That’s great, Erik. You can Google ‘picture books for fussy eaters’…there are a couple of websites that have posts which give 10-15 book titles. Good luck on the PB draft. 🙂 By the way, Susanna’s class is awesome! Thanks Vivian! I’m going to check out the book it sounds great. The video made me realize how boring the food is at our house. Well this whole post has me howling! I love broccoli myself. And I’m more than happy to clean up what the kids throw out. I’ll have to look for this book. thanks! And I’ll bet that name, Boss, had some meaning behind it! Thankfully, I only ended up with one (out of 3) “picky” eater! That said, the other two had their own challenges. One was Gluten Free (long before there were GF foods in the stores) and the other was a vegetarian from grade 4 on. Dinner time was NEVER easy! LOVE the food art, but would never have had time for it. Just glorious though!